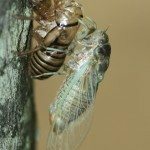 Brushing against the wrong plant in the garden may send a cloud of what appears to be tiny, jumping cicadas into the air, alarming gardeners and sending them running for pesticides. 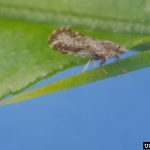 Before you spray those psyllids, read a little more about them so you better understand the difference between harmless psyllids and psyllid pests, as well as ways of getting rid of psyllids that pose a real threat to your plants. Psyllids, also known as plant lice, are tiny, sap-sucking insects with very host-specific feeding preferences. Most species of psyllids will feed exclusively on a single type of plant, though some may expand their horizons to closely-related family members. There are over 100 species, ranging in size from 1/10 to 1/5 inch long. Like other sap-feeders, psyllids penetrate plant tissues, tapping into transport tissues and siphoning off part of the nutrient-laden liquids running through them. As they feed, psyllids produce honeydew, a sweet, sticky substance that may attract ants or mold colonies. However, most species are not harmful to their host plants in moderate numbers. Damaged plants may show a loss of vigor, or terminals may be distorted, discolored or even die back. A few species may cause defoliation or gall formation on leaves and buds. Young, tender growth is most often targeted. Some of the most serious psyllid problems occur on tomatoes and potatoes – psyllids on established landscape trees rarely cause anything more than aesthetic damage. Psyllid control information available online may recommend a wide range of chemical sprays, monitoring and beating of the bushes, but in practice, psyllids on most plants can be ignored so long as you put the broad-spectrum insecticides away and allow beneficial insects to feed in your garden. When damage becomes unbearable, weekly sprays of neem oil or insecticidal soap will kill most psyllids. Don’t try to prune psyllids out, they’re very mobile and will just jump away. Make sure that psyllids are still feeding on your plants before you attempt treatment. Often, by the time that damage is obvious, the psyllids have been destroyed by natural agents. If you carefully monitor your plants daily, you’ll know if these pests are still active. Although neem oil and insecticidal soap are relatively safe for beneficial insects, spraying them when there are no insects to control is a waste of money.